My goals in designing this car have been to achieve high performance, superb handling, a luxurious interior, and elegance of appearance. The Piranha is imagined to be a car that will be equally at home on a road trip or a Concours d'Elegance; a car to be driven rather than simply admired! The styling is very "retro" yet it is also modern in the sense of having wide enough fenders to accommodate wider tires and a highly capable up to date all wheel independent suspension. The grille is somewhat "Bugatti" or "Morgan" like. The fenders are a little like the AC Cobra, but brought back into the semi-teardrop shape of the late thirties. The roof and trunk have elements of the very fine Talbot-Lago and the Delage / Delahaye designs of the same period. As with those original Berlinetta types, the Piranha has a long and slender shape, with performance at the top of its class. Rather than re-invent any of the excellent technology that is already available, such as engine and drive train components, it has instead been my intent to apply what modern technology has to offer. The result? An outstanding new road car for two...! 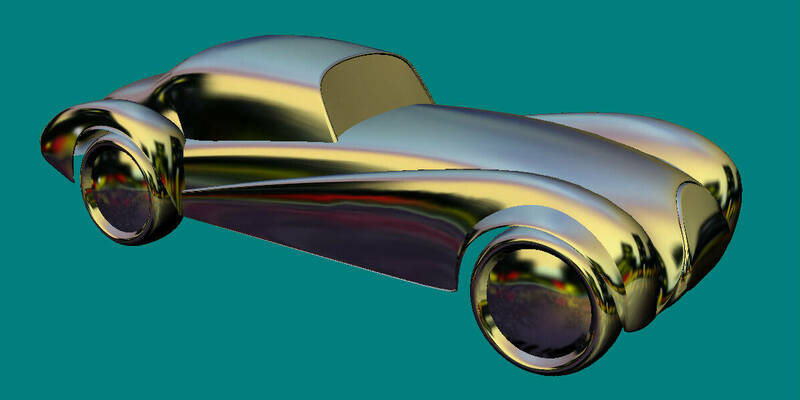 Here are links to several images of the emerging car design. The images are listed chronologically, with the most recent among them last. The most recent images show the car with a split windshield. This is not a "kit car" nor really a "concept" car, but instead a completely new automobile design. Many of the following specifics are as-yet very preliminary. These particulars should be viewed more as a statement of the type and the intended capability of the car and it's equipment than an exact list of what would be used in the final design. Therefore at this early stage, components may be changed to suit a particular requirement. Aside from the body itself, all of these components are readily available from custom rod shops or directly from the manufacturers. Overall Dimensions: 160 Inches Length by 60 Inches Width by 56 Inches Height. Track: 55 Inches Front and Rear. Target Weight: Under 2,500 lbs. Target Weight Distribution: 50% Front - 50% Rear. Body: Vinyl Ester and Kevlar Lightweight Composite. Doors: Hinged at Rear, Safety Latch at Front. Trim: Stainless Bumpers, Stainless Grille. Engine: 500 hp Aluminum Corvette V-8 or Viper V-10 Crate Motor (There are many other possibilities such as the excellent big block aluminum racing engines by Merlin). Transmission: Tremec or Richmond 5 speed; Optional 4 speed automatic. Chassis: Custom fabricated steel rectangular tube frame, sealed and epoxy painted. Independent Rear Suspension: Corvette, Viper, Thunderbird, or Custom. Brakes: Wilwood or Baer Disks all around. Tires: Wide Profile Radials that can be driven "Flat" when punctured. Spare: None: no spare or jack. Storage: Trunk, and In Back of Seats. Lights: Recessed CIBIE Front with Contoured Glass Cover, LED Rear. Signals: LED Front and Rear. Seats: Recaro or Custom Seats; Stitched Leather. Instruments: Classic Cream Color Round Gauges . Dash: Flat Wooden Dash; Electronics hidden behind access panels. Wheel: Tilting, Telescoping, Locking, Classic 3 Spoke Flat Aluminum, Wood Rim. Features: Power Steering, Power Brakes, Air Conditioning, Power Windows, Power Locks, Alarm System, GPS Mapping, Radar Detection, Inverter for AC Power Outlet, Cellular Phone. Stereo: Hidden CD Changer, MB Quart Speakers & Sub, 400 Watts. Although my work has been primarily focused on the design of power and sailing yachts, I also have an ongoing passion for fine cars. In particular, cars which exhibit both elegance and high performance in one package. The Piranha car may seem an unusual project for a marine designer... In a way perhaps, although there are several very strong parallels between yacht design and automobile design. I have taken advantage of the excellent technology available to industrial designers and to the boat building industry. 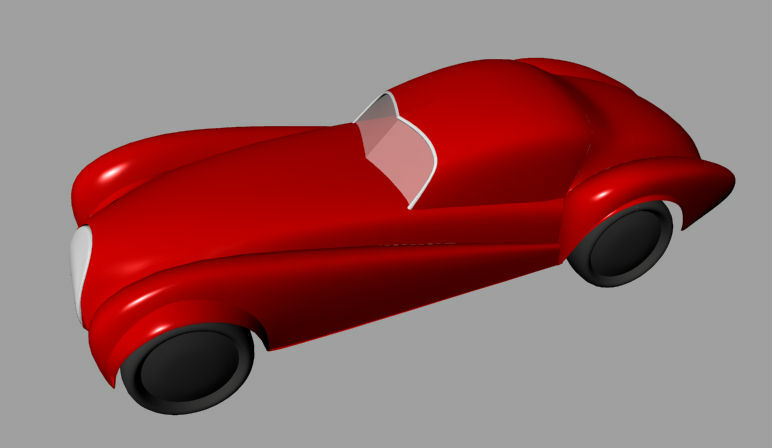 This car's styling has been developed entirely within Maxsurf, software for Naval Architects. Maxsurf makes use of an intuitive 3-D modeling interface to create freeform surface models, and allows one to easily fair the surfaces, analyze surface curvature, then finally to output the design to a CAD environment for detailing. 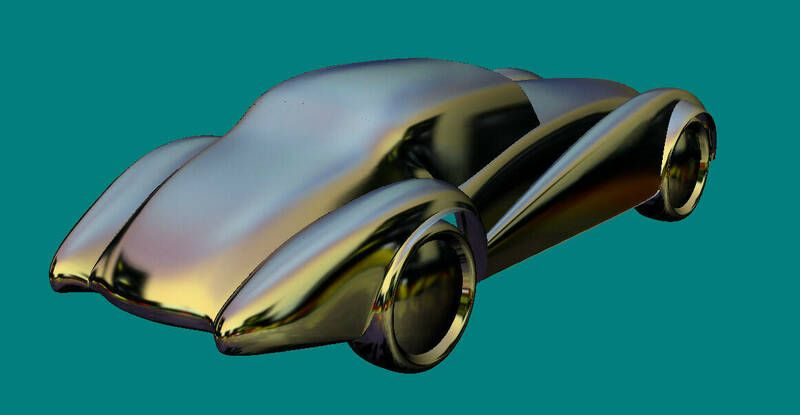 For example, the model shown here was created in Maxsurf, then exported from Maxsurf via IGES to Rhino, another highly capable program for 3-D modeling, detailing, and rendering. The Maxsurf or Rhino surface model will be exported via IGES to a large 5 axis cutting machine. This step has already been verified for the Piranha by Janicki Machine, of Sedro Woolley, Washington. 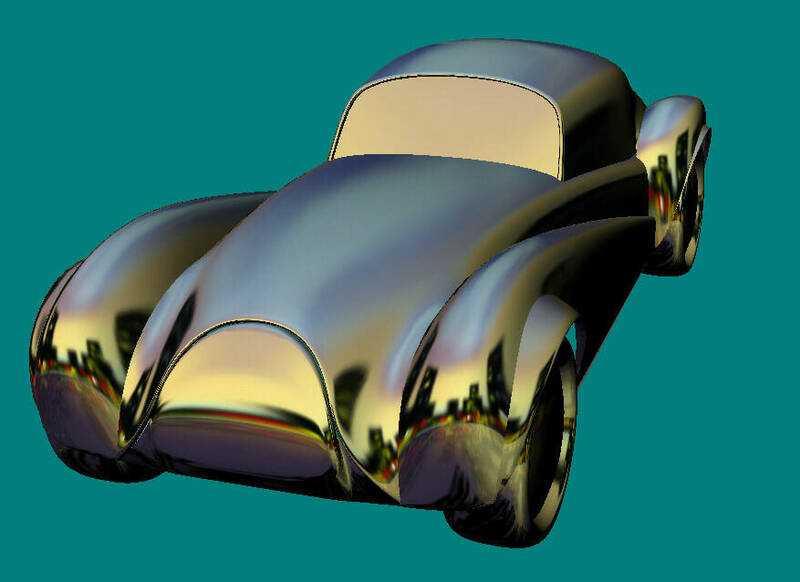 Janicki has provided an estimate for tooling costs, both to create a "desktop" size model of the car directly from the surface geometry, and to create the full size body components. Once the 5 axis router has been set up, the individual parts such as fenders, hood, top, trunk will be cut out of slabs of tooling foam, then coated and faired. From these "plugs," permanent female "molds" will be created, within which the separate body parts can be laminated. These permanent molds will allow identical fiberglass parts to be made for subsequent cars. There has not been a specific time line established for this project. It is not a project intended for myself, so it will wait until an interested owner is inspired by the concept of creating an outstanding new "retro cruiser" in order to pursue building the Piranha.